Candy canes - 12 days of nail art | Light Your Nails! Today’s theme for the 12 days of nail art challenge is candy canes and Winter nail art challenge’s theme is Christmas cookies/candies so once again I could join both! I started with two coats of Astra Expert Gel Effect 02 Neige and stamped over it with a red foil nail polish and plate MR-01. Then I topped everything with Color Club Matte-ified. Oggi riesco di nuovo ad aggregarmi a due gruppi nail art in un colpo solo. I temi sono infatti i bastoncini di zucchero per uno e i dolci/caramelle natalizi per l’altro. Sono partita con due passate di Astra Expert Gel Effect 02 Neige e ci ho stampato sopra con uno smalto rosso foil e il dischetto per stampa MR-01. Infine ho steso il Color Club Matte-ified per sigillare il tutto. Btw, last pic is before the matte top coat. I prefer the mattified version though. What do you think? Agree with me? E questo è quanto! Semplice e veloce. Ah, l’ultima foto è pre-top coat. A me però piace più la versione matte. Voi che dite? I like the matte version too better! Super cute! And so neatly! Your stamping is perfect, I'm jealous! I cannot believe I havent had a candy cane this year. This is such a great stamping image, very cute! 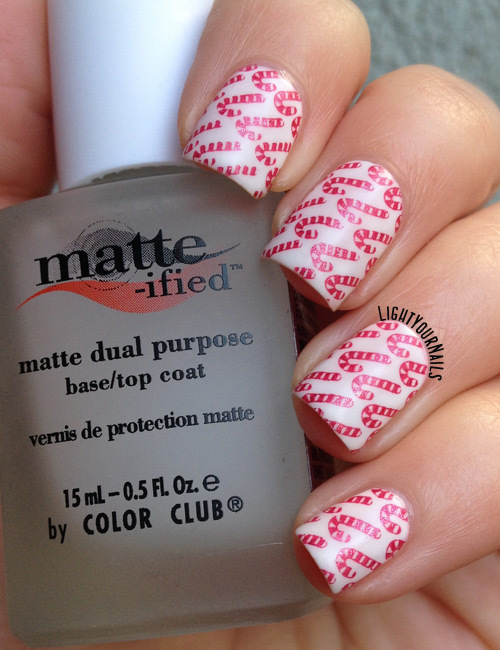 This is such a great candy cane mani, like raining candy canes! How fun would that be in real life? Haha! Yeah, the matte version makes the candy canes pop a bit more! This might be the best candy cane stamping plate I've seen! The matte version is amazing! Great job! Thank you! I love that white.